Half whip the cream, place into the refrigerator. Crack the eggs into a stainless steel bowl, whisk thoroughly till the eggs start to thicken, slowly add the sugar and continue whisking. Keep adding all the sugar slowly and beat till the mixture has doubled and has a pale creamy white colour. Fold in the whipped cream and mix till well combined. Add the maple syrup and chopped walnuts to the mixture, fold in the syrup. Pour into a bowl, cover and place into the freezer over night. 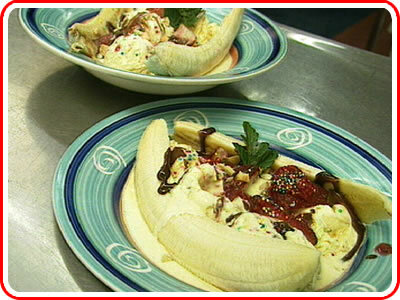 Serve up as a banana split or as a sundae.